The two alternate identities of Bruce Willis -- curmudgeonly father-figure who must occasionally save the planet from annihilation and baby-boomer pop-bluesman Bruno Radolini -- rarely interact with one another. On August 2, however, they will. As part of the Netflix LIVE! music and movies series, Willis is leading his band The Accelerators in a blues concert outside the Kennedy Space Center in Cape Canaveral, Florida. The concert will then be followed by an outdoor screening of Armageddon. 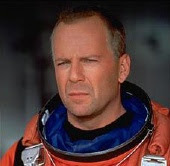 For those of you who paid vast sums of money to have Armageddon total-recalled out of your memory, that was the movie where Willis teamed up with Ben Affleck and Billy Bob Thorton to stop a giant rock from crasing into the planet. Willis had this to say about the music-movie event: "It is truly thrilling to return to The Kennedy Space Center to enjoy 'Armageddon' with my band on hand. Movies have been my career, but music has always been my love, so I am excited about merging the two worlds in such a unique way and being able to share it with so many people." About 5,000 fans are expected to pack the Center's Rocket Garden for the show that begins at 7:30pm on August 2nd and Netflix had this to say about the Willis event: "Netflix LIVE! On Location is a great way for us to share the Netflix experience with thousands of people around the country. Bruce's popularity with movie fans is enduring, and we are delighted to be able bring him back to Kennedy Space Center for this one-of-a-kind event." The Netflix LIVE! On Location series is also expected to announce more music-movie pairings in the coming weeks.